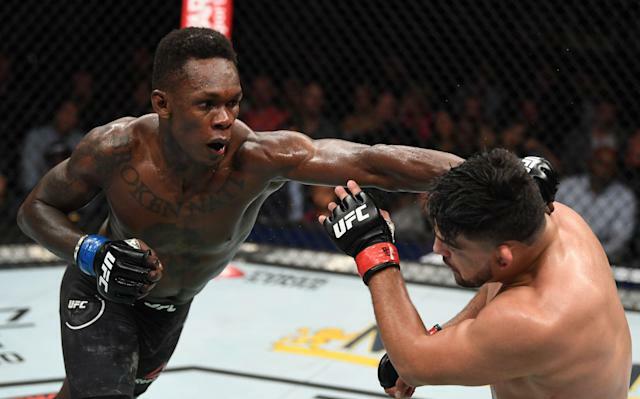 Israel Adesanya grew up idolizing Anderson Silva, and the UFC middleweight did a lot of Silva-like things in his bout with Kelvin Gastelum for the interim title Saturday in the co-main event of UFC 236 at State Farm Arena in Atlanta. Adesanya completed a meteoric 14-month rise to the top the division when he outlasted Gastelum in a monumental battle, winning a unanimous decision by scores of 48-46 on all three judges’ cards. Yahoo Sports also had it 48-46. Adesanya won the round 10-8 on all three judges’ cards that cinched the belt and probably put it into the lead for the mythical Fight of the Year honor.